They can't tell you something is wrong and, when you find out, you can feel like a heel for not noticing it sooner. Case in point. Monday evening, Mija jumped up onto the chair next to me in the office. She wanted ear scratches but seemed to not want me touching her chin, a rarity. I looked at said chin and it appeared dirty. That's odd. There's no dirt in the house of sufficient quantity to merit a dirty chin. Closer examination revealed this was blood. I looked at her chin. She had a spot on the right underside which was open and bleeding. Grabbing a warm, damp washcloth, I tried to blot the area so I could see it better. She actually yelped, something she almost never does. Clearly, there was an issue. Tuesday morning, I looked again at the chin and this spot looked 'goopy', for lack of a better word, almost like it was seeping. Vet trip. Vets don't know why, but cats with white fur on their chin are prone to feline acne. It looks like dirt spots, although a bit too perfectly round to be dirt. When you wipe, the spots don't come off. You're not to try to squeeze them as they could become more easily infected and your cat probably won't sit still for you to try to get a blackhead out of their chin. They will go away on their own, but, occasionally, one will become infected and abscess. The vet tech moisted the area where there was now a scab, probably from her scratching because it hurt, and removed a large scab and pus. That was gross. The vet irrigated the now open abscess, making sure it was clean. Mija was given an antibiotic shot and that was that. She was a trooper. Part of me thinks she didn't feel well either because it hurt. I was told she might be a bit lethargic so if she didn't eat Tuesday night, not to worry. But, if she didn't eat in the morning, that would be cause for concern. 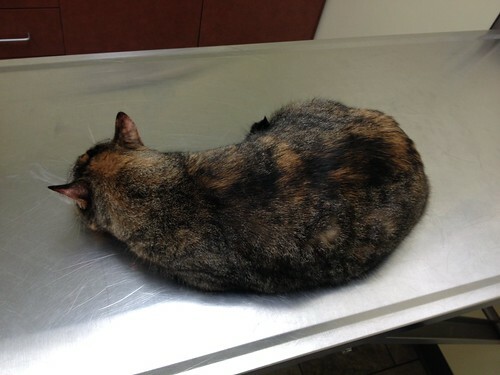 Loss of appetite is a side effect of the antibiotic shot and so she would have to be watched. We came home and she bolted from the cat carrier, going under the bed. Pilchard, hearing us come home and knowing that she is generally next when it comes to vet visits, jumped off the bed where she had been lying, and darted under it. There was a quick hiss and Mija charged into the office, going to hide in the closet. I put the carrier away and went into the kitchen to make some supper; a nice turkey and swiss sandwich with apple slices. On a good note, Mija had lost 2 pounds, although she looks a mite plump here. The switch to wet food in the morning has helped her shed the pounds and she's at her ideal weight. I separated the pieces of turkey and felt a tap on the back of my right leg. Looking down, there she was. 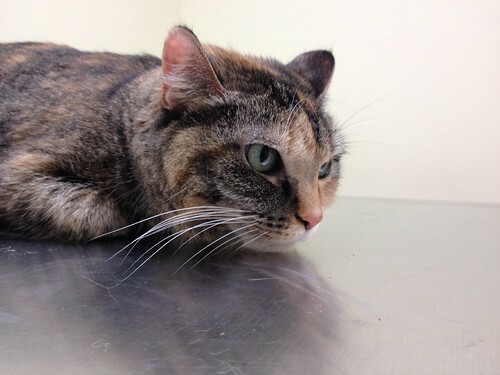 She loves deli turkey and no amount of to the vet potential was going to keep her from mooching. "Might not eat tonight" my foot. I gave her a couple of small pieces and she was blissfully happy. So, I wondered if I had just missed the abscess over the weekend. I hadn't noticed her favoring her chin or scratching more or not allowing me to scratch her chin. The vet said an abscess like that can take a couple of days to form but it would have been small to start. It was only on Monday, when it got big and painful, that I would have noticed. It didn't mean I was a horrible companion. I don't have to do anything for this. She probably wasn't going to let me rinse the area or blot it with a wet wash cloth. It would scab over and, because they had cleaned it out, would not cause her much irritation. I am to check her chin over the weekend, just to make sure it's healing. In the future, once a month, I should check her chin. She's going to do a good job of keeping herself clean but it will help me know if something doesn't look right which might need vet intervention. This morning, she was her old self again, telling me it was time to open a can of cat food for breakfast. Of course I feel badly that this happened, even though it appears I couldn't have done anything to prevent it before it abscessed. I did notice that she didn't want me scratching her chin this morning, but everywhere else was acceptable. Our first cat, Shakespeare, had these, usually one abscess a year. They tend to develop when the cat is 5+ years old. The really bad, oozing, ones would require a cone to keep the cat from scratching or cleaning the area so antibiotic cream could be applied. I'm glad we didn't have to go that route. So, if you have a white-chinned cat, take a look. If you notice blackheads, you'll want to monitor them. They should go away without help, but if one gets red and swollen, you probably should have the vet look at it BEFORE the cat slices it open on her own.